Radiant floor heating has been a technique used since the days of the ancient Romans. It uses warm water (usually anywhere from 80 degrees to 140 degrees) to heat the floors in your home or building. 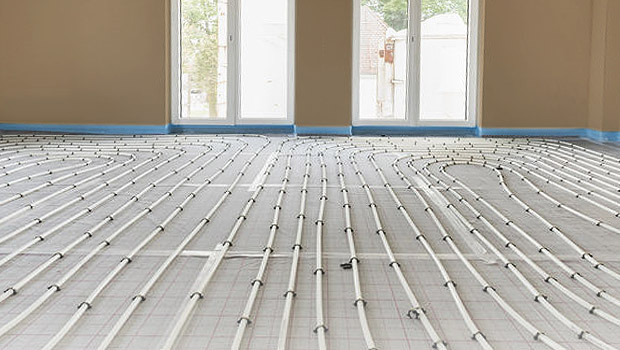 Once the water is heated, it’s circulated through flexible, durable PEX tubing that’s concealed inside the flooring. When the floors get warm, the warm air travels upward and warms the rest of the room. It also warms the walls and the objects in the room. Many homeowners and businesses prefer radiant floor heating to convection heat because convection heat doesn’t always heat the whole body. Since it doesn’t begin at the floor, the warm air travels upward and heats the upper part of your body, but neglects to warm the lower part of your body. When your extremities (particularly your feet and legs) are warm, you often feel warmth all over. Because the radiant heat is concealed in your flooring, you won’t have to worry about a furnace or radiators taking up space in your home or building. It’s also very energy efficient, saving you 20%-40% over other residential and commercial heating systems. It doesn’t use a duct system that can absorb the warmth of forced air. It also doesn’t use energy to warm cold air from outside (which also decreases humidity and can make you feel colder). This type of heating can work under floors of nearly any type, whether it’s tile, carpet, wood, marble, or another material. If you’re interested in incorporating radiant heat into your home, give us a call today.